On Friday, March 15, the euro trading ended slightly up (+ 0.18%). EURUSD course showed mixed trends at all sessions. The high volatility observed in the US session. It euro rose to 1.1344. The growth of EUR / USD was caused weakness of the dollar after the release of US economic data. The data showed that manufacturing in the US fell for the second month in a row in February, while manufacturing activity in New York has been weaker than expected this month. US Federal Reserve data show slowing economic growth. Based on them, the controller can change the future course of monetary policy. At 13:00 the euro zone is to publish data on the change in the balance of foreign trade in January. At 14:00 released the monthly report of the Bundesbank. At 15:30 Canada will announce the change in the volume of transactions with foreign securities in January. At 16:15 to give a speech, Vice-President of the ECB Luis de Guindos. At 17:00 the US will release the index of the housing market in March NAHB. At 23:00 New Zealand will present the index of economic confidence from Westpac for the I quarter. On Friday, the turning point coincided with the target line on the range of motion - no. Weak data in the US has changed the market sentiment towards risky assets. Demand for them is observed to the present day. All major currencies are trading in positive territory against the US dollar, except the Japanese yen. On Friday EURUSD has been forecast up to 19 March. In the phase of reducing the EURUSD buyers were able to keep the level of 1.13. The breakdown of the trend line turned out to be false. Old script left on the schedule. While EURUSD has not broken the 135 degrees, the risk of a walk to 1.1260. Through the top of 1.1338 and 1.1344 I held the line and put a parallel line to a minimum 1.1294. Today, I stick to the script, in which the expected movement of EURUSD above the trend line and below 1.1350. A retreat from 1.1300 EURUSD increased the chances of buyers breakdown 1.1350, followed by an increase to the level of 1.1376. Price rises without volume. If the current hour will be a large amount, it will point to the fixing and the beginning of EURUSD correction. I make a bet on the rebound, but you must understand that it is my expectation by phase inversion. 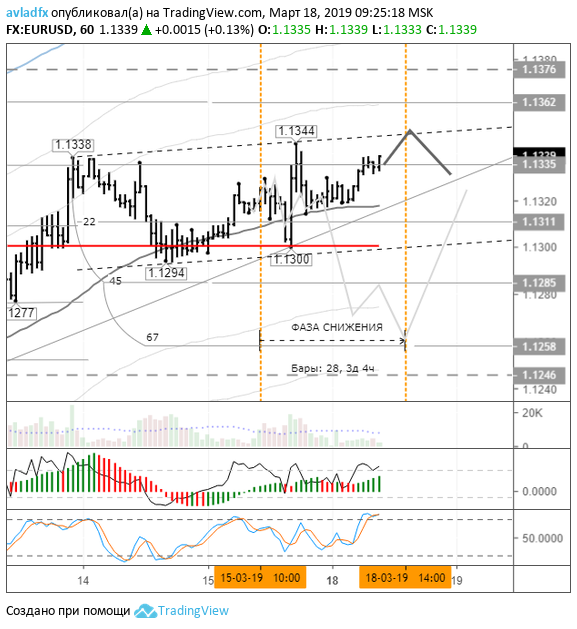 If the EURUSD decline phase does not fall, then she should go down after 14:00.